Azakus Limited offers six investment plans that are divided into three investment periods – for 60 days, for 90 days and for 120 days. The first plan (min investment $20; max investment $5000) offer 1.8% daily for 60 days, the second (min investment $5001; max investment $10000) 2% daily for 60 days, the third plan (min investment $10001; max investment $15000) 2.25% daily for 90 days, the fourth plan (min investment $15001; max investment $20000) 2.5% daily for 90 days. While the last two plans offer 2.7% daily (min investment $20001; max investment $30000) and 3% daily (min investment $30001; max investment $40000) for 120 days. For all plans, the initial deposit is returned at the end of the investment period. Please notice, that the profit is generated Monday through Friday. The minimum and maximum withdrawal are not set and withdrawal requests are processed instantly. 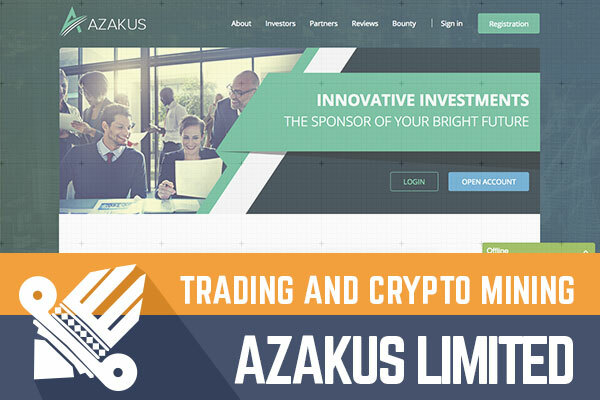 Azakus Limited accept PerfectMoney, advcash, Bitcoin, Litecoin, Dogecoin, Ethereum, Bitcoin Cash and Dash. Note that cryptocurrencies are converted into US dollars. If the investment offer is a bit twisted (daily plans with profit generated on business days), then in terms of the legend and the website Azakus Limited is one damn simple HYIP. What’s my first impression? A standard website template is filled with even more standard content. It seems that the admins have limited their creativity as much as they could. The only things that they have enhanced on the homepage, for example, is EV SSL Certificate, DDOS Protection, and fast withdrawals. Can this help distinguish Azakus Limited from many similar HYIP programs? Not sure. Nevertheless, my first impression doesn’t affect the performance of the program. What your first impression? Leave a comment in the chat box below! In my previous review, I shared my thought how so-called cryptocurrency inspired programs have changed lately. I would say that according to the legend, this program is combining the both - cryptocurrency mining and cryptocurrency trading. So, how exactly Azakus Limited position themselves. According to the website, Azakus Limited calls themselves “the sponsors of your bright future” offering to handle your investments. Namely, their main activities are forex and cryptocurrency trading as well as cryptocurrency mining. If you want to find out more about Azakus Limited activities, feel free to visit the website to learn more about their mining farm and the development of ULTRA a Saas model-based business. For all potential investors, I strongly recommend visiting the FAQ page to find information that might be useful before making an investment. If someone is interested in taking part in the affiliate program visit the Partner page. An investment calculator is available on the website, but it has a twist again. You can choose one of the three plans (2%,2.5%, and 3% plans) however, there are six investment offers in total. Yet the calculations seem to be right also for the plans that are not included. The website has a valid SSL certificate assigned by Comodo RSA and it’s valid until September 5, 2019. Moreover, the admins have added the certificate of incorporation which confirms that a company named Azakus Limited has been incorporated on August 6, 2018. What does the Internet say about our latest rival? Nothing unusual yet. The investment plans and investment periods as always divide the potential investors – some who try to invest in the very beginning to make the most of it. Some doesn’t really rely on this offer. In terms of the main audiences, Alexa rank highlights the following countries – United States, China, Russia, Philippines and Ukraine. So, let's take a look at the investment opportunities. An investment of $200 (in the first plan 1.8% daily for 60 days) would generate a daily return of $3.60. At the end of the investment term, a $200 investment would have made a net profit of $216. Of course, in case the program will last 60 days. Also, please note that there are withdrawal fees for daily interests. Today I am reviewing a two-week old program with mid-term plans and interest rates varying from 1.8% to 3%. I have already mentioned everything I wanted to say about this program. Even though the program is simple in terms of the legend and the content it looks fine and afterall you have to judge the investment offer yourself. Therefore, if you ever decide to make any investments, don’t invest more than you can afford to lose! Have you already made an investment in Azakus Limited is and have any useful information to share with us? Please drop a message in the chat box to share your experience! Investment plans: 1.8% and 2% daily for 60 days, 2.25% and 2.5% daily for 90 days, 2.75% and 3% daily for 120 days. Initial deposit returned at the end of the investment period. Payment processors: PerfectMoney, advcash, Bitcoin, Litecoin, Dogecoin, Ethereum, Bitcoin Cash and Dash.